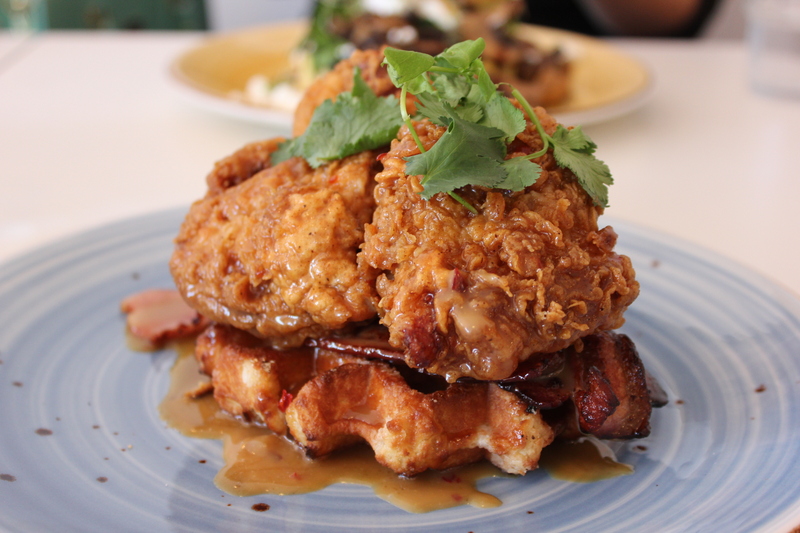 Recently, the fried chicken and bacon combination with hot cakes or waffles craze has been gaining its popularity in Perth. This combination of savoury and sweet together might some odd to some but you will be definitely be surprised that the flavour actually marries well together. On a sunny weekday, my childhood friend, Jess from Keep Calm and Just Eat and I head to Good Things for brunch. I had the Southern fried chicken, waffles and chilli butterscotch dish, topped with maple bacon for $5. Like what I have heard from everyone else too, I thought that the dish was very delicious and bursting full of savoury and sweet flavours. The start of the dish would be the Southern fried chicken. It is crispy with a crunch in every bite. 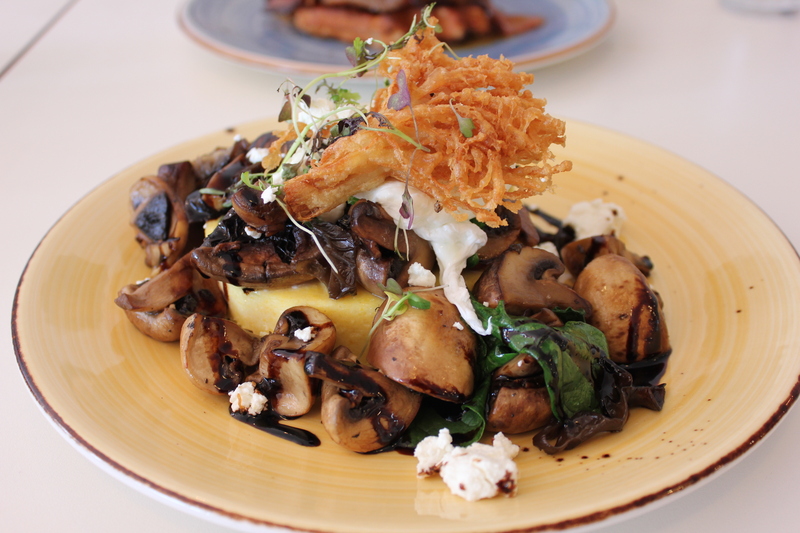 Jess had the polenta cake, balsamic mushrooms, tempura enoki, spinach, goat’s cheese and poached egg. The poached egg was perfectly poached. Cutting through it revealed a smooth flowing golden yellow liquid. I had a bit of a taste of her dish and it was a pack full of earthy flavours from the mushrooms and the crisp textures of the tempura enoki. Don’t get me wrong, it’s a pretty hearty dish too. Overall, Jess and I were glad that we decided to chose Good Things for our brunch date and we will definitely be back again as everything on the menu sounds good! The service is also friendly and efficient. What I love about Good Things is also their simple interior with plenty of natural lighting (perfect for good food photography!) and an airy, cool breeze coming through the windows. It’s a great place to catch up over coffee and indulge in some good, hearty breakfast or brunch food. The fried chicken, bacon and waffle looks absolutely incredible!!! My mouth is watering just looking at it!